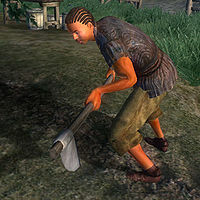 Shameer is a Redguard archer who lives across the street from the front entrance to the Great Chapel of Julianos in Skingrad. He sleeps inside his house from just after midnight until 6am and then decides what to do next depending on the weather. If it's dry he heads off to work in Tamika's vineyards just west of town. At 11am he stops and has lunch before heading back to work again from 1pm until 7pm — again, as long as it's dry. He then eats dinner for two hours with Tamika's other workers before heading home. He will walk around his house until bedtime. If rain starts to fall while he's supposed to be in the fields, Shameer will head home and wander around his house, although he will head back to work if the weather clears up. Shameer carries no food with him so relies on finding some when eating lunch and dinner. The nearby shelter often contains food, but if none remains, his low responsibility means that Shameer will sometimes try to steal some from another citizen, at times causing him to be accosted by the guards. This may even result in his untimely death at their hands. Shameer wears a lower-class outfit consisting of sack cloth pants and a matching shirt with stitched leather shoes. He also carries a few coins, the key to his house, and a hoe and rake that respawn. Shameer is a basic trainer in Marksman and will offer services all day except when eating or sleeping. He clearly enjoys both his work and his hobby. He will introduce himself with: "I'm a fair hand at grapes and bows. Shameer, grower and trainer. But I suspect you want to shoot, not grow grapes. Am I right?" When asked about Skingrad, he seems to see it only in those terms: "Reman Broder... he works Surilie's vineyard, I work Tamika's vineyard... Reman spent 20 years in the legion, and he's an advanced Marksman trainer." Other residents also agree that bows and grapes are Shameer's life. They will say that: "I've seen Shameer at the Tamika Vineyards practicing archery. He's really good. I might try to get some pointers from him." and "Not only does Shameer make a good wine at the Tamika Vineyards, but he's really good with his bow, too. I heard he'll train you, for a fee." Others will respond: "I've heard he's good with his bow, and he'll train you, for a price. I like the wine he makes, too." and "With all that time in the vineyard, it's a wonder he has time to practice his marksmanship." Similar to City-Swimmer, Shameer might try to steal food, resulting is his untimely death. This page was last modified on 17 August 2018, at 13:49.